When In Manila, crafters and non-crafters have been going crazy over the washi tape designs that keep popping out in the market. I, myself, cannot choose easily when hundreds of designs are laid in front of me. If you are wondering where can you see these washi tapes in actual, Moonleaf Tea Shop in Maginhawa, Quezon City has launched their craft corner where products of Filipino crafters are sold. Included in the items are bracelets, tarp wallets, handmade crafts by Abbey Sy, Hey Kessy items and the newest addition, washi tapes originally designed by Hey Kessy! What are washi tapes anyway? Washi tapes originated in Japan. They are like masking tape, but very, very pretty ones! It comes in patterns and designs that will surely trigger the creativity in you! Last Sunday, We attended the launch of the FIRST originally designed washi tapes by Hey Kessy. The three designs were made by their resident graphic designer and illustrator, Paul Imbong. This exclusive line of washi tapes will be their first collection which includes Beep jeep, Hoy hoy hoy and Too cute designs. More to come soon as Hey Kessy collaborates with other Filipino artists, designers and crafters! After the launch, we proceeded to making our own crafts. And because Hey Kessy aims to let people know how washi tapes can be useful in crafts, she organized a small craft workshops for us! We made our own 3D monograms using washi tapes, papers and baker’s twine. 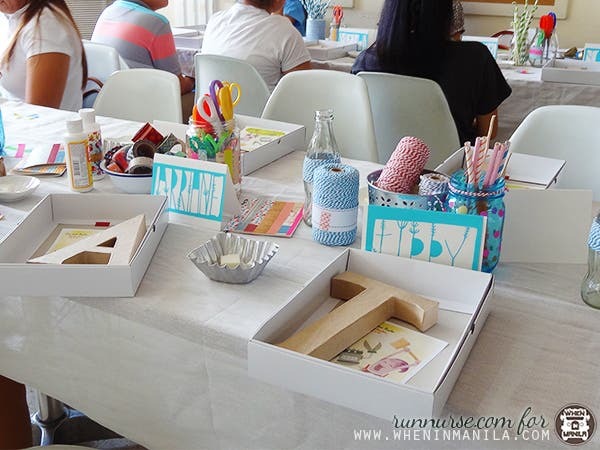 Materials like the different washi tapes, scissors, baker’s twine and glue were all provided on the table. It’s just a matter of what design you plan do. I really had a hard time on deciding what design to do, but for the other participants, I think they already had their designs planned! It was indeed a very creative and enjoyable afternoon. What made it more exciting was everyone got snacks from the Moonleaf Tea Shop. And after we were done with our 3D monograms, 3 winners were chosen! I really wished I won… but the winners really had beautiful works! Congratulations to the winners! Of course, a workshop won’t end without a class picture, SMILE! When In Manila, don’t forget to drop by Moonleaf Tea Shop’s Craft Corner! Let us support Filipino artists and buy Filipino crafts just like the washi tapes originally designed by Hey Kessy! Here’s my 3D monogram masterpiece designed with Hey Kessy washi tapes and baker’s twine!